Step behind Tick nall Village Hall and discover Ticknall’s best kept secret. Dame Catherine Harpur’s School is an enchanting environment set within green lawns and hidden dens, with the spire of St George’s Church just a stone’s throw away. This magical oasis is one of the reasons why our pupils are so happy here. Our school provides a first class all-round education for girls and boys in a happy family environment from three to eleven years of age. Dame Catherine’s has an incredibly happy environment, small enough for children to receive individual encouragement and support, yet large enough to provide them with social and intellectual stimulation and a rich variety of experiences. Our Nursery offers full day care, with Government Funded Vouchers for 5 sessions per week, plus supervised lunch sessions, and the option of wrap-around care 8.00am – 6pm. Please contact us to discuss available sessions as we limit our numbers to eight children per session, which benefits the children hugely. Our facilities include 4 teaching rooms, incorporating our library and resource area and a music / activity room, cloakrooms, an office and kitchen as well as the nursery area. 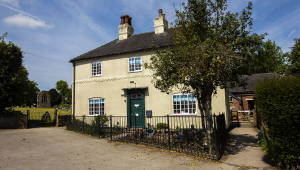 We make full use of the adjacent village hall for PE, which also supports us in offering a variety of extra-curricular activities and after school sessions, whether this be music lessons, multi-sports, dance or cooking. We are always responding to needs and new ideas. 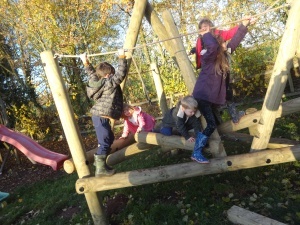 As well as a spacious playground, there is also a large garden, incorporating wildlife areas, gardening plots, a muddy kitchen as well as brand new play equipment funded from a lottery grant. The garden and wider surroundings are used on a daily basis, not only in our forest school sessions, but also to promote learning, from history and art to science – outdoor learning is a speciality of ours at Dame Catherine’s. This is not only great fun for the children, but also helps to promote their awareness of the environment. We have close links with the neighbouring Calke Estate (National Trust) and are regular visitors to the grounds and facilities they have to offer.